Once we checked in we were greeted by Floren, given a tour of the house and escorted to our room. She waited as we put our stuff away and then walked us to the beach showing us the short cut and telling us about the guesthouse and surrounding area. Our room was cleaned every day and breakfast is included (We didn’t experience breakfast but heard it is lovely.) Laundry service is available, as well as motorbike rental and assistance in all of your travel plans. Jules is a great travel planner and she will have daily trips planned outlining where you should go and what to see/do if you ask her. I can’t begin to say enough about Jules and Agung. They are the owners of Teka-Teki and treat everyone that stays with them as family. They are a Balinese-Australian couple that have two fun loving dogs and one cat that all guard over the house. Our first day, Jules invited us to join her and Agung at his family birthday party for their 10 year old nephew. We danced, we ate and Josh even got on stage with the family band and jammed out with them! 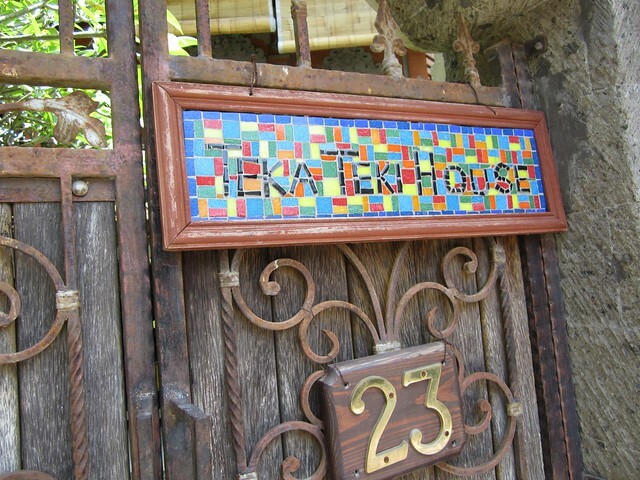 Teka-Teki is a traditional style Balinese house updated with Western comforts, personally designed by Jules and Agung. 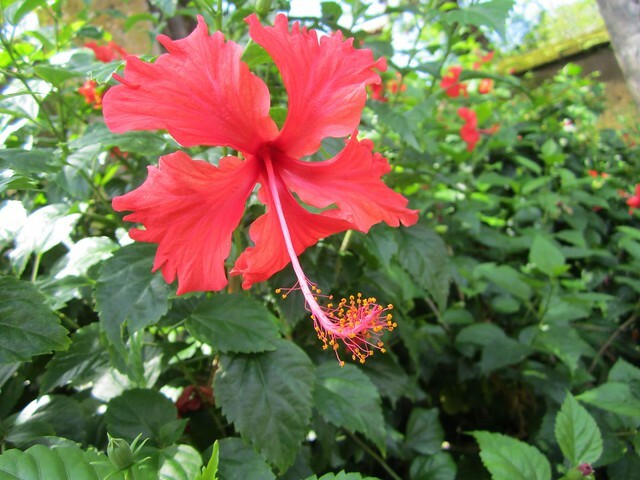 You arrive and walk through an intricate gate that opens up to a very well kept lush garden on the first floor. There are chairs and an umbrella to sit under and enjoy a drink and the company of the other guests. 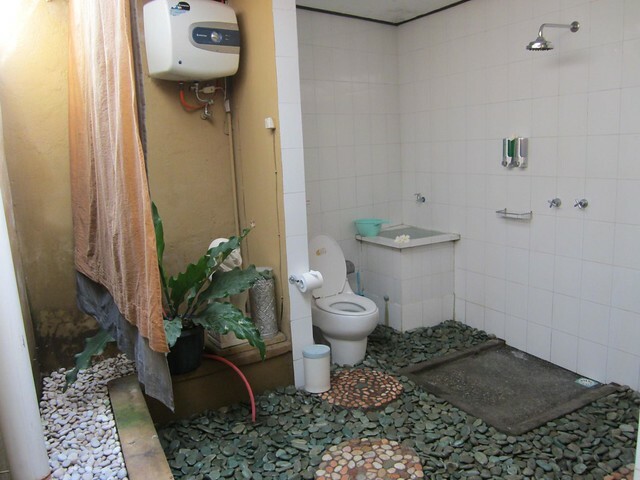 It is a 6 bedroom house with 2 fan-cooled rooms and the rest with A/C. 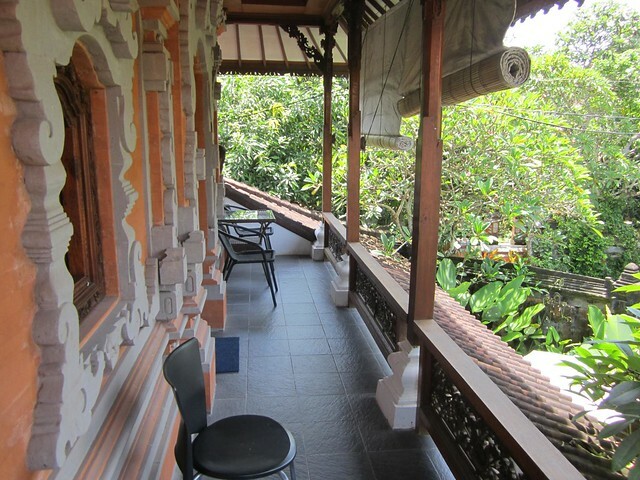 We opted for the fan-cooled Legong room which has its own huge veranda overlooking the front entry. Every day we sat outside enjoying the sounds and peace and quiet of Bali. There is a communal kitchen with complimentary coffee and tea as well has a small snack bar with bites to eat and drinks in case you need a quick snack. The bed is very comfortable and clean. They give you electric mosquito repellent so you can sleep with your windows open and not worry about being bitten. 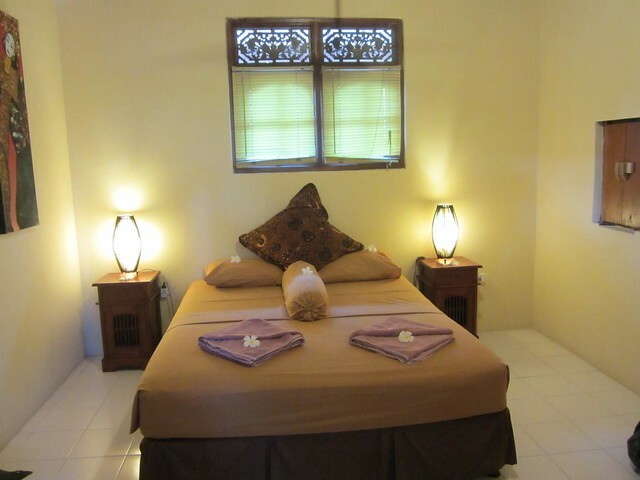 The Legong room is on the second floor so the breeze is great and we were woken up every morning by the sunrise. Even being so close to a busy street and shops, Teka-Teki is very quiet at night and we never had any issues with noise. The price of the room includes a big breakfast, which is one of Jules’ passions, insisting her guests leave the morning with full bellies! She will also suggest some really great restaurants in the area. We went to a BBQ on the beach while we listened to a fantastic local band, walked around the corner to yummy indian food and tried the local indonesian favorites at Cabe Rawit, a well-priced and delicious local eatery. When we travel we love having a small kitchen in order to cook our own food, make coffee and tea and of course our morning oatmeal. Seminyak is a more touristy area so some of the restaurants are a bit more expensive and generic. We found a couple local places and loved the food we tried. Every morning we ate oatmeal, coffee and fruit we bought from the market. For a one time fee of 20,000 IDR ($2.25 USD) you can use the internet for your entire stay. The internet is fast, especially compared to other home stays in the area. If you stay in the Legong room you have a lovely veranda to sit outside and use your computer in the shade overlooking the garden at Teka-Teki. We were able to Skype, upload our photos and do a lot of writing, all which makes us happy when we have uninterrupted Internet access. 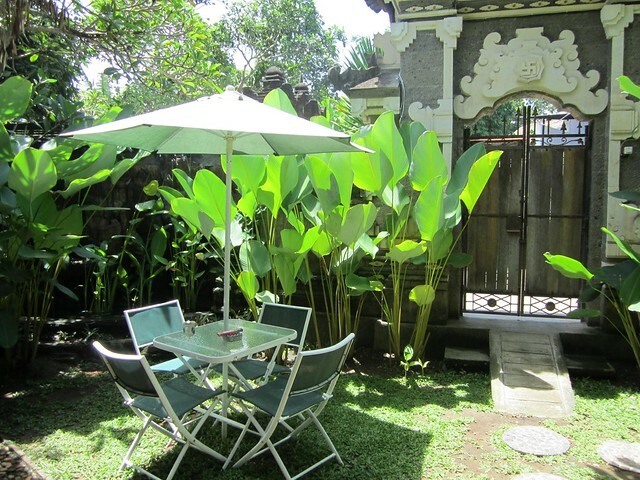 The guesthouse is located in the heart of Seminyak, along the southwest coast of Bali in Indonesia. 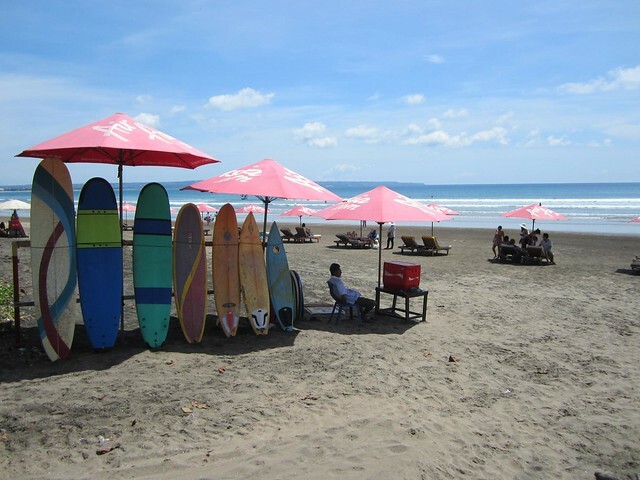 Seminyak is a more upscale posh area, with small boutiques popping up and new restaurants. Teka-Teki is such a gem in this area because you are able to stay 1 minute off a bustling street, less than a 10 min walk to the beach, but when you are at the guesthouse you won’t hear any of it, only peace and quiet! Absolutely, we might even come back again in a few weeks to end our trip in Bali. We have loved the atmosphere, the peace and quiet, and also being a quick walk from a bustling beach area. It is a true home stay with a caring staff. 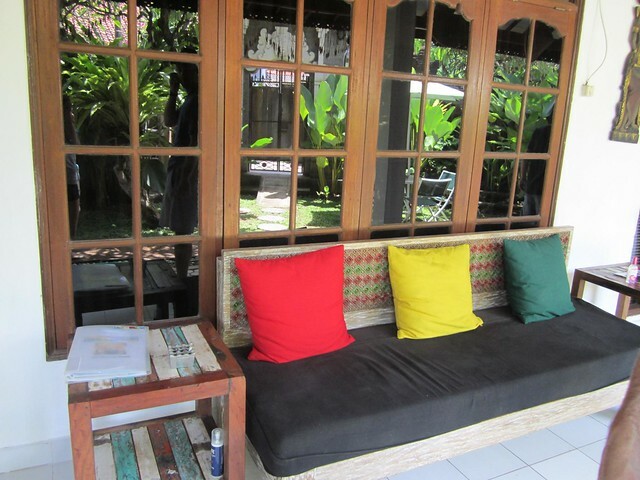 We would recommend it to anyone wanting to stay in the Kuta/Legian/Seminyak area.